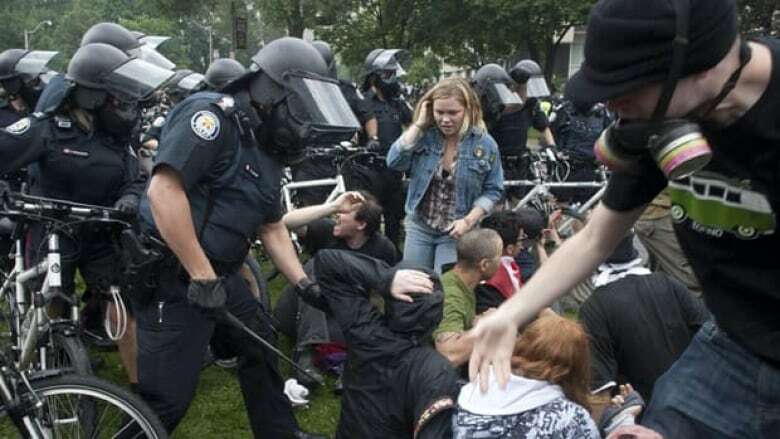 A full public inquiry is needed to probe allegations of police abuses during the G20 in Toronto, a report says, but Ontario Premier Dalton McGuinty has again rejected the idea. A comprehensive public inquiry is needed to investigate allegations of abuses and illegal actions by police during the G20 summit in Toronto last summer, civil rights advocates said Monday. The Canadian Civil Liberties Association and a national umbrella group of public-sector unions released a report that examines the planning and implementation of security measures at the summit from June 26-27, 2010. The "Breach of the Peace" report calls for a joint federal-provincial public inquiry to determine who was responsible for "serious violations of fundamental rights and freedoms." Ontario Premier Dalton McGuinty again rejected those calls Monday morning, saying there are already five reviews underway into the G20. More than 1,100 people were arrested when thousands of police cracked down on protesters during the summit. Nathalie Des Rosiers, general counsel of the CCLA, said the public still does not know why the vandalism and arrests occurred and "why the right to peacefully protest was not protected." "The scale of civil rights violations goes beyond the actions of a few misbehaving police officers," Des Rosiers told reporters in Ottawa. "Hundreds of police officers removed their badges and many told protesters that martial law had been declared and that protesters had no longer any rights and they could be held as long as necessary. "The failure to train police officers properly, the strategy deployed is what we are questioning today. All the misleading information about the [Ontario] Public Works Protection Act, all of this needs to be investigated properly." A spokeswoman for the Toronto Police Service said the force is co-operating with the various investigations into police conduct during the G20. Meaghan Gray said in an email the force's Professional Standards branch is investigating 80 complaints referred to it by the Office of the Independent Police Review Director, and officers have faced internal discipline as a result. "If the CCLA, or anyone else, has evidence of alleged wrongdoing, they should provide it to the Office of the Independent Police Review Director," Gray wrote. The "violent dispersal of protesters" at the designated G20 protest site at Queen's Park. The "absence of police when acts of vandalism were occurring." The "failure of firefighters" to extinguish police cruisers set on fire. Mass detentions and arrests and delays or failure to provide medical care to those arrested. Mass arrests at a University of Toronto residence building. The prolonged detention at the corner of Queen Street and Spadina Avenue in a procedure known as "kettling." The conditions of detention at the Eastern Avenue detention centre. "Changes must be made to the police practices and training that accompany the public order, policing that is supposed to be there to facilitate the right to peaceful protests," Des Rosiers said. McGuinty acknowledged Monday he has seen some of the videos that have emerged showing police violently arresting and detaining people, but he declined to comment on the videos or why police decided to arrest people on the lawn of Queen's Park, where the premier had invited them to protest during the summit. The report follows public hearings last fall. It examines a range of issues, including stops and searches, the use of force, arrests and a controversial security regulation passed by the province ahead of the summit. Lawyers, academics and dozens of people who were caught up in the chaos during the G20 protests spoke at the public hearings over three days in Toronto and Montreal. Toronto police and the Ontario Provincial Police declined to appear at the hearings, held to raise public awareness about what happened on the streets of Toronto during the summit, said Nathalie Des Rosiers, general counsel for the Canadian Civil Liberties Association. Speakers included John Pruyn, who described a run-in with police during a protest at Queen's Park — a designated speech zone during the summit. Pruyn, 58, alleges he had his prosthetic leg yanked off by police, who arrested him as he sat on the grass at the Ontario legislature. Astonishing new images caught on camera expose a troubling new picture of what happened to hundreds of ordinary citizens caught in the huge police dragnet during the G20 summit, when more than 1,100 people were arrested. CBC's Gillian Findlay examines the summit and the protests that surrounded it, and in a rare television interview, Toronto police Chief Bill Blair explains why police took the actions they did. The document also looks at several reports of mass arrests, including a June 27 raid at the University of Toronto's Graduate Student's Union building, where many activists from Quebec were staying. Reports indicate more than 70 activists were arrested in the early-morning raid, which was recorded on a video obtained by CBC's The Fifth Estate. Police said the officers, armed with rubber bullets and tear gas, were trying to find the vandals who had smashed windows and set a police car on fire the previous day. Toronto police Chief Bill Blair defended the armed raid in an interview with The Fifth Estate, saying tactical officers are used when police are entering a place where violence may occur. The charges against the 70 activists were later dropped, the report says. The Toronto Police Services Board, Ontario's Office of the Independent Police Review Director and Ontario's ombudsman have all delved into the events surrounding the Toronto summit. In December, ombudsman André Marin said "the most massive compromise of civil liberties in Canadian history" had occurred during the G20 weekend. But the authors of the new report argue that police leaders in charge of security need to answer for what they call "an alarming number of incidents" of illegal arrests, detentions and police brutality. "In the CCLA’s view, the rights violations raise serious systemic questions about policing policy and training that can only be resolved through a comprehensive federal-provincial public inquiry," said Des Rosiers.